One of the most reliable estimates of the relation between the radius of a neutron star and its mass has been made. Neutron stars are the ultra-dense cores often left behind when massive stars collapse. They contain the densest matter in the Universe outside of black holes. Data from Chandra and other X-ray telescopes were used to understand more about the interior structure of neutron stars. Neutron stars, the ultra-dense cores left behind after massive stars collapse, contain the densest matter known in the Universe outside of a black hole. New results from Chandra and other X-ray telescopes have provided one of the most reliable determinations yet of the relation between the radius of a neutron star and its mass. These results constrain how nuclear matter - protons and neutrons, and their constituent quarks - interact under the extreme conditions found in neutron stars. Three telescopes - Chandra, ESA's XMM-Newton, and NASA's Rossi X-ray Timing Explorer (RXTE) - were used to observe 8 neutron stars, including one in 47 Tucanae, a globular cluster located about 15,000 light years away in the outskirts of the Milky Way. 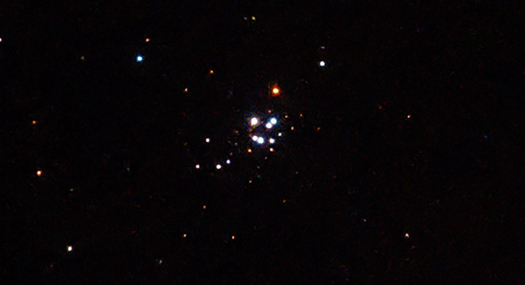 The image shown here was constructed from a long Chandra observation of 47 Tucanae. Lower-energy X-rays are red, X-rays with intermediate energies are green, and the highest-energy X-rays are shown in blue. In the image, the double, or binary, star system labeled as X7 contains a neutron star slowly pulling gas away from a companion star with a mass much lower than the Sun. In 2006, researchers used observations of the amount of X-rays from X7 at different energies together with theoretical models to determine a relationship between the mass and the radius of the neutron star. 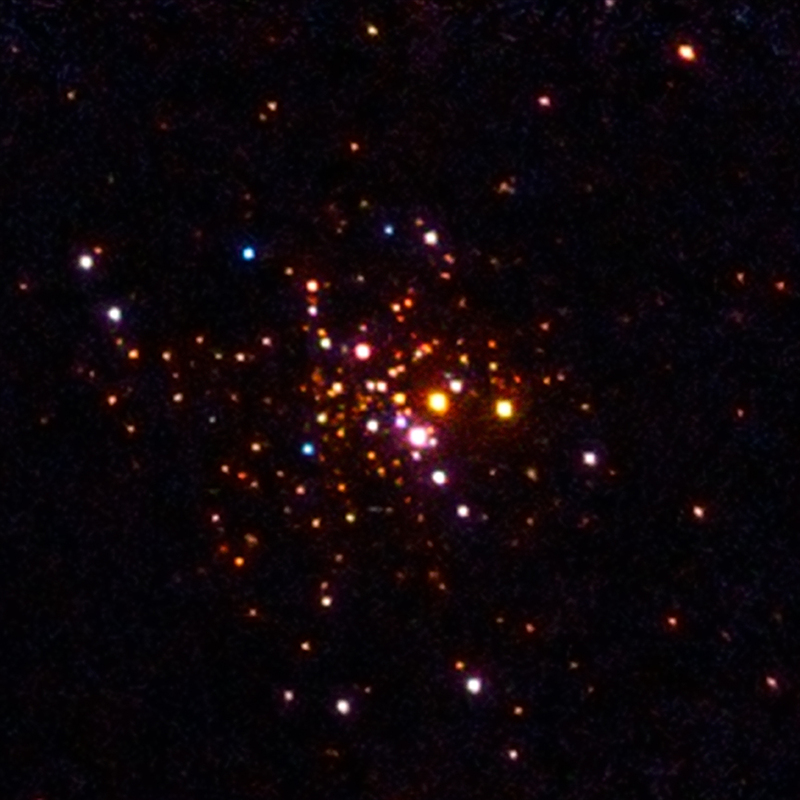 A similar procedure was used for Chandra observations of a neutron star in another globular cluster, NGC 6397, and for two other neutron stars in clusters observed by ESA's XMM-Newton. Four other neutron stars were observed with RXTE to undergo bursts of X-rays that cause the atmosphere of the neutron star to expand. By following the cooling of the star, its surface area can be calculated. Then, by folding in independent estimates of the distance to the neutron star, scientists were able to gather more information on the relationships between the masses and radii of these neutron stars. Because the mass and radius of a neutron star is directly related to interactions between the particles in the interior of the star, the latest results give scientists new information about the inner workings of neutron stars. The researchers used a wide range of different models for the structure of these collapsed objects and determined that the radius of a neutron star with a mass that is 1.4 times the mass of the Sun is between 10.4 and 12.9 km (6.5 to 8.0 miles). They also estimated the density at the center of a neutron star was about 8 times that of nuclear matter found in Earth-like conditions. This translates into a pressure that is over ten trillion trillion times the pressure required for diamonds to form inside the Earth. The results apply whether the entire set of bursting sources, or the most extreme of the other sources, are removed from the sample. Previous studies have used smaller samples of neutron stars or have not accounted for as many uncertainties in using the models. The new values for the neutron star's structure should hold true even if matter composed of free quarks exists in the core of the star. Quarks are fundamental particles that combine to form protons and neutrons and are not usually found in isolation. It has been postulated that free quarks may exist inside the centers of neutron stars, but no firm evidence for this has ever been found. The researchers also made an estimate of the distances between neutrons and protons in atomic nuclei here on earth. A larger neutron star radius naturally implies that, on average, neutrons and protons in a heavy nucleus are farther apart. Their estimate is being compared with values from terrestrial experiments. The neutron star observations also provided new information about the so-called "symmetry energy" for nuclear matter, which is the energy cost required to create a system with a different number of protons than neutrons. The symmetry energy is important for neutron stars because they contain almost ten times as many neutrons as protons. It is also important for heavy atoms on Earth, like Uranium, because they often have more neutrons than protons. The results show that the symmetry energy does not change much with density. These results will be published in a paper in the March 1st, 2013 issue of The Astrophysical Journal Letters. The authors are Andrew Steiner, from the Institute for Nuclear Theory at the University of Washington, James Lattimer from Stony Brook University in New York and Edward Brown from Michigan State University. Observation Time 100 (4 days, 4 hours). Thanks, it's really informatics I mean I didn't know there are stars that have more neutrons than protons. Awesome. Thank you. It is very informatics. I like neutron stars. Photo above is awesome. I like it. Very informative for me. Thank you. Thank you for the info. I am very interested in anything related to astronomy. I had forgotten Kepler's 3rd Law it was good to see it again and use it. A globular cluster located about 15,000 light years from Earth. 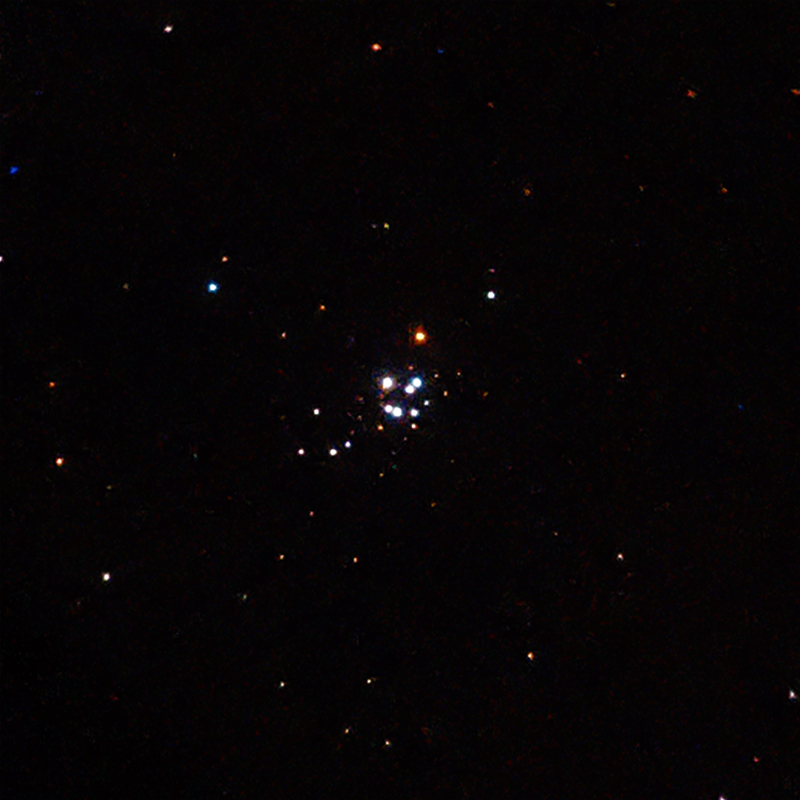 Image is 2.3 arcmin across (10 light years across). Lower-energy X-rays are red, medium-energy X-rays are green, highest-energy X-rays are blue.